Algeria, Argentina, Australia, Belgium, Brazil, Bulgaria, Canada, Chile, China, Colombia, Cuba, Czech Republic, Domenican Republic, Ecuador, Egypt, Estonia, France, Germany, Hungary, India, Indonesia, Iran, Ireland, Israel, Italy, Japan, Kazakhstan, Latvia, Libya, Lithuania, Malaysia, Mexico, Morocco, Netherlands, Nigeria, Panama, Peru, Philippines, Poland, Portugal, Romania, Russia, Saudi Arabia, Senegal, Singapore, South Africa, South Korea, Spain, Sweden, Switzerland, Taiwan, Thailand, Tunisia, Turkey, United Arab Emirates, United Kingdom, United States, Uruguay, Vietnam, Vietnam. 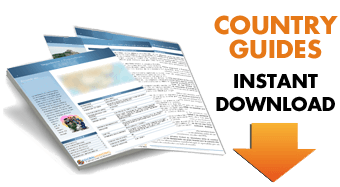 Each Country Guide offers detailed information about: Key facts, Business Environment, Negotiation Strategies, Business Culture, Customs & Etiquette and essential websites. By purchasing this Pack, you can save 140 € on the cost of the Guides individually. Inmediatlely after payment has been made, we will send you an email containing the Business Culture and Etiquette Guides in 60 countries around the world.